Economists have recently tried to identify why some firms survive longer than others in export markets. This column examines the firm-level determinants of the duration of Japanese manufacturing firms’ exporting. It suggests that the degree to which products are differentiated matters for firms’ survivability, and that policies to support R&D activities thus indirectly contribute to increasing firms’ chances of survival in foreign markets. 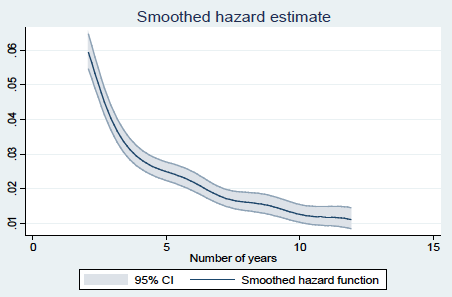 Given that many firms appear to be unable to continue exporting indefinitely, a considerable number of empirical studies have examined the determinants of firms’ duration (or survivability) in export markets. However, a lack of firm-level data on exports and imports means that the majority of studies have been unable to examine the role of firm-level characteristics and instead have had to rely on country- and product-level trade statistics and focus on the role of country-of-origin and/or country-of-destination characteristics in export duration (e.g. Besedeš and Prusa 2006a, 2006b, Nitsch 2009, Brenton et al. 2010, Carrère and Strauss-Kahn 2014). Although there have recently been a number of studies focusing on firm-level characteristics in explaining export duration (e.g. Békés and Muraközy 2012, Esteve-Pérez et al. 2013, Gullstrand and Persson 2015), such firm-level empirical evidence is still comparatively scarce. This means that our knowledge on firm-level trade patterns – in particular, temporary or on-off exporting by firms – is still limited and that it is not sufficiently clear what kind of firms become always exporters. 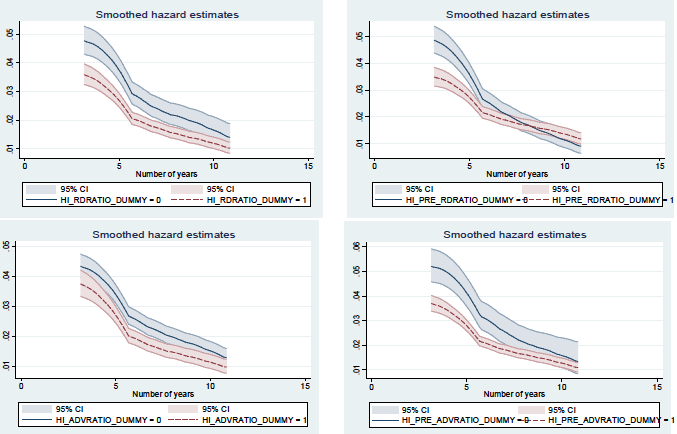 Against this background, we examine firm-level determinants of the duration of exporting in recent research (Inui et al. 2015, 2017). Following preceding studies, we assume that firms incur two types of fixed costs: the upfront sunk fixed costs required to start exporting; and per-period fixed costs to continue exporting, such as the costs involved in maintaining an overseas distribution network. These two types of fixed costs interact with export dynamics in multiple ways. For example, Békés and Muraközy (2012) suggest that firms that pay larger upfront sunk costs when entering export markets subsequently incur lower variable export costs such as that for transport. Such firms, in turn, likely will earn higher profits from exporting and are more likely to continue exporting even if they are hit by a demand or productivity shock. Therefore, firms that pay higher upfront sunk costs are expected to display higher survivability in export markets. Moreover, firms that can expect a stable stream of profits from exporting likely have a strong incentive to pay the upfront sunk costs in order to stay in export markets as long as possible. An example of such upfront sunk costs is the investment a firm makes to set up a distribution network or build storage facilities abroad in order to start exporting. Even when the firm, rather than setting up its own distribution network or storage facilities, decides to use an existing overseas distribution network through intermediaries such as local wholesalers, the firm will incur some upfront sunk costs such as that involved in searching for a good local wholesaler. Meanwhile, per-period fixed costs are expected to fall as firms become more experienced in export markets, because such experience is likely to help firms to become better at forecasting foreign demand and to find better and reliable foreign partners. Through such learning-by-exporting, the uncertainty associated with future sales, transaction partners, and contract forms that exporters face decreases, resulting in a decline in per-period fixed costs as exporters accumulate more experience in export markets. This effect of export experience is likely to lead to higher survivability in export markets. Our studies are the first to explicitly examine both the effects of the upfront sunk costs when entering export markets and the effect arising from firms’ previous export market experience. As mentioned at the outset, more productive firms are more likely to pay the upfront fixed costs required to start exporting, since they can more reasonably expect a stable stream of profits from exporting than less productive firms, and they are also more likely to continue exporting for a longer period. However, the mechanism through which more productive firms are more profitable and hence more likely to stay in export markets is not entirely clear. One possibility is that more productive firms are more profitable because they are more cost competitive. Another possibility is that they produce differentiated goods that allow them to charge higher markups. However, conventional productivity measures cannot distinguish between these different sources of productivity. In our research we assume that firms producing differentiated products are more likely to earn a stable stream of profits from exporting once they established their product brand or distribution network. The rationale for this assumption is that irreversible investments such as those in marketing and advertising as well as wholesale and retail distribution in foreign markets, and adapting products to local demand idiosyncrasies, should matter more for profitability in the case of differentiated products than in the case of homogeneous products. Therefore, firms producing more differentiated products should have a greater incentive to incur upfront sunk fixed costs that enable them to achieve a more stable stream of profits from exporting, resulting in a higher probability of survival in export markets. While most extant studies rely on country-product-destination-level trade data, we were able to use firm-level data allowing us to investigate the role of export experience and product differentiation in export survival while controlling for firm heterogeneity. Although there is a growing number of studies examining firm-level export spells, this study is still one of only a few empirical studies relying on firm-level data. The results of our estimations show, first, that the probability of exiting from export markets significantly decreases as export duration increases (see Figure 1), implying that firms’ export experience influences their survivability. Note: The horizontal axis shows the number of years measured from the entry to export markets, while the vertical axis represents the probability that a firm exits from export markets in the next period, conditional on the non-occurrence of this event as of t.
Second, the probability of exiting from export markets is lower if firms are more research and development (R&D) and/or advertising intensive (see Figure 2). Based on the trade technology choice and export duration model by Békés and Muraközy (2012), we hypothesised that firms that are more likely to differentiate their products through R&D or advertising can survive in export markets longer. Our hypothesis assumes that firms producing differentiated products have a greater incentive to incur the upfront sunk fixed costs necessary to start and successfully continue exporting, since they can reasonably expect to achieve a stable stream of profits from exporting through marketing, establishing distribution networks, and/or adapting products to the idiosyncratic characteristics of local demand, resulting in longer export duration. Our estimation results support this hypothesis. Our finding that the degree to which products are differentiated matters for firms’ survivability in export markets also has implications for government policy. One such implication, for example, is that policies aimed at providing support to exporters should be targeted at firms and industries producing differentiated products rather than homogeneous products. Another is that policies to support R&D activities – desirable in their own right to boost productivity growth –also contribute indirectly to increasing firms’ survivability in export markets. Editors’ note: The main research on which this column is based first appeared as a Discussion Paper of the Research Institute of Economy, Trade and Industry (RIETI) of Japan. Békés, G. and B. Muraközy (2012) “Temporary Trade and Heterogeneous Firms,” Journal of International Economics 87(2): 232–246. Besedeš, T. and T. J. Prusa (2006a) “Ins, Outs, and the Duration of Trade,” Canadian Journal of Economics 39(1): 266–295. Besedeš, T. and T. J. Prusa (2006b) “Product Differentiation and Duration of U.S. Import Trade,” Journal of International Economics 70(2): 339–358. Brenton, P., Saborowski, C. and E. von Uexkull (2010) “What Explains the Low Survival Rate of Developing Country Export Flows?” The World Bank Economic Review 24(3): 474–499. Carrère, C. and V. Strauss-Kahn (2014) “Developing Countries Exports Survival in the OECD: Does Experience Matter?” CEPR Discussion Paper 10059, London, Centre for Economic Policy Research. Esteve-Pérez, S., Requena-Silvente, F. and V. J. Pallardó-Lopez (2013) “The Duration of Firm-Destination Export Relationships: Evidence from Spain, 1997-2006,” Economic Inquiry 51(1): 159–180. Gullstrand, J. and M. Persson (2015) “How to Combine High Sunk Costs of Exporting and Low Export Survival,” Review of World Economics 151(1): 23–51. Inui, T., K. Ito, and D. Miyakawa (2015), “Export Experience, Product Differentiation, and Firm Survival in Export Markets,” RIETI Discussion Paper Series 15-E-086. Inui, T., K. Ito, and D. Miyakawa (2017), “Export Experience, Product Differentiation, and Firm Survival in Export Markets,” Japanese Economic Review 68(2): 217-231. Melitz, M. J. (2003) “The Impact of Trade on Intra-Industry Reallocations and Aggregate Industry Productivity,” Econometrica 71(6): 1695–1725. Nitsch, V. (2009) “Die another day: duration in German import trade,” Review World Economics, 45(1): 133–154. The data we used in Inui et al. (2015, 2017), which this column is based on, show a similar median export duration (seven years) for Japanese manufacturing exporters and, moreover, that only a small number of firms survive more than five years in the export market.